1 How to Get rid of dark underarms fast? 2.1 1. How to lighten armpits with Lemon? 2.4 4. How to remove underarms darkness with Orange peel? How to Get rid of dark underarms: Darkness on the face, hands and other visible regions on our body might be due to sun tan, exposure to various environmental conditions, and also some medical conditions. But, the underarm darkness is a bit different case. Regular shaving, Usage od deodorants, Excessive fat accumulation, etc. are the reasons for dark armpits. Whatever might be the reason, the dark underarms will decrease your confidence levels to choose a sleeveless outfit. So, to bid a bye to this condition, try our ten best ways to get rid of dark underarms and wear your favorite outfits. How to Get rid of dark underarms fast? Except in the Acanthosis nigricans case, general underarm darkness can be treated quickly with few home remedies. In te Acanthosis Nigricans condition we should consult a medical advice. So, know the best home remedies to get rid of dark armpits. 1. How to lighten armpits with Lemon? Every time I write the home remedies for a condition; I feel so amazed looking at the little sour lemons. I think these are the simplest possible solution if it comes to Skin upgrading. So, use the lemon juice to lighten underarms naturally. Lemons are excellent bleaching agents that can lighten dark armpits and make you more confident when you wear a sleeveless. Also, the Lemons are antiseptic in nature which can also act against body odor. So, apply lemon juice regularly to lighten underarms faster. Mix both the ingredients and rub the mixture on the dark armpit area for 3-4 minutes and leave it for 5 minutes. Do this regularly before you take a bath. You can also use lemon alone if you wish. How to lighten armpits with saffron? I know that many of you don’t even think of using this home remedy to get rid of dark underarms. But, this is a very effective treatment that is very gentle on your skin. Mix a pinch of saffron and milk cream together to make a thick paste and rub it gently on your dark armpits. Leave it for 10 minutes and take a shower. Baking soda acts as an exfoliating scrub and removes the dark outer layers when used regularly. It is an effective agent to get rid of dark underarms overnight. So, make a thick paste of baking soda using rose water and apply it as a thick coat on the affected area and gently massage for 5 minutes and rinse it with water. 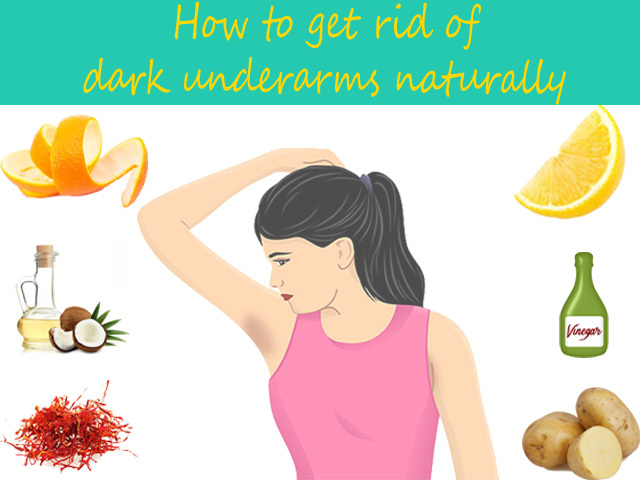 Use this best home remedy for underarm darkness and odor to get smoother and lighter armpits naturally. 4. How to remove underarms darkness with Orange peel? Orange peel extracts are very efficient in bringing out the natural glow. From the ages immemorial, orange peel powder is used to treat the darkness of skin. The Oranges contain bleaching and exfoliating properties which help us to lighten the dark underarms. It also can be utilized as a natural deodorant. It acts as a natural scrub for your armpits and prevents the darkness by removing the dead skin cells. Also, due to the intense fragrance, it also helps to eliminate the body odor naturally. Orange peel acts as a natural scrub for your armpits and reduces the darkness gradually. Know how to get rid of underarm darkness using orange peel and use it whenever necessary. Collect orange peels and allow them to the sundry for few days. When the peels lose the moisture completely, grind them into fine powder and store in an airtight container. Take two tablespoons full of orange peel powder and add two tablespoons full of milk or milk cream. Mix them well by adding rose water to make a fine paste like consistency. Gently exfoliate your skin using this orange peel for 5 minutes and leave it as such for 10 minutes and wash it with water. Use this best home remedy for discolored skin twice a week. Coconut oil is an inexpensive, safe and best of all home remedies for dark underarms. But, you can not get rid of dark underarms in a day with this solution. Coconut oil removes the darkness gradually on regular usage. So, if you want to include the safest possible method to get rid of black armpits then use coconut oil regularly. Potatoes are slightly acidic in nature that can bleach your dark skin. So, to lighten underarms naturally, we can seek assistance from potatoes. Potatoes do not irritate your skin though it is acidic in nature. So, rub a thin slice of potato on the affected area to get rid of armpit stains. It is not new for us to use sandalwood to treat our skin problems. It is well known for its skin lightening properties from the ancient times. So, use the sandalwood powder to lighten black underarms naturally. Also, the same remedy for discolored skin treatment can also reduce the body odor with its natural fragrance. Take two tablespoons full of sandalwood powder and add milk or milk cream to it. Mix both the ingredients well and add rose water as required. Apply this paste on your underarms and leave it for 15-20 minutes. Wash it with water and use this remedy daily to get lighter underarms instantly. Using vinegar to get rid of armpit stains is one of the best ways to get rid of dark underarms faster. Just like lemons, vinegar also acts as an antiseptic agent and eliminates the body odor. It also lightens the armpit stains and gives you smooth underarms in one day. Just grab a cotton ball and dip it in the vinegar solution and rub it on the black armpits twice a day. So, these are the best ways to get rid of dark armpits naturally. Whenever you are trying to lighten underarms, do not rely on any expensive cosmetics as they may cause irritation on your skin on prolonged usage. Therefore, Get rid of black armpits with these simple and natural remedies which are safe and efficient in removing the black armpits.